"Sani(slow one) aka Sanaischara(one who moves slowly) aka Saneeswara (The god who is slow) is the planet Saturn among the nine planets. He is the son of Surya and Chaya and is the only planet with the epithet Iswara(god). He takes 30 years to make a full round of the Sun and so he becomes the slowest among the planets. He was made lame by his half brother Yama(God of death). He is the indicator of longevity, diseases, death, base actions, reason for death, danger,slave hood and cattle wealth in a person’s horoscope." Today is saturday,which is especially dedicated to Lord Shanidev. Devotees offers oil, salt in the Shani Temple.People keep fast on each saturday to please lord shani or saturn. 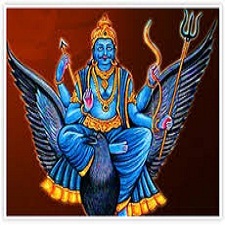 It is believed that by worshipping Shani or Saturn, all the obstacles or Dosha in kundali's are resolved. These are the different ways by which we can get blessings from Lord Shani.We are giving the "Shaniashtakam stotra" and its importance.You can download these stotra from our website.